On Tuesday, surgeons at CHOP successfully completed the separation of 10-month-old conjoined twins Erin and Abby Delaney. The infant girls, from North Carolina, were joined at the top of their heads, a condition called craniopagus. In an 11-hour operation, surgeons at Children's Hospital of Philadelphia last week separated 10-month-old twin girls who were joined at the top of their heads, the rarest type of conjoined twins, the hospital disclosed Tuesday. The separation and reconstructive operations on Erin and Abby Delaney of North Carolina followed months of imaging studies and planning by a large team from Children's. The hospital says it had separated 22 other sets of conjoined twins over the last 60 years, but never siblings joined at the head. The procedure, known as craniopagus surgery, has been conducted only about 60 times since 1952. Last year, Children's Hospital at Montefiore Medical Center in the Bronx, N.Y., performed the head surgery successfully to separate twin boys at 13 months of age. Parents Heather and Riley Delaney with their daughters before the surgery. 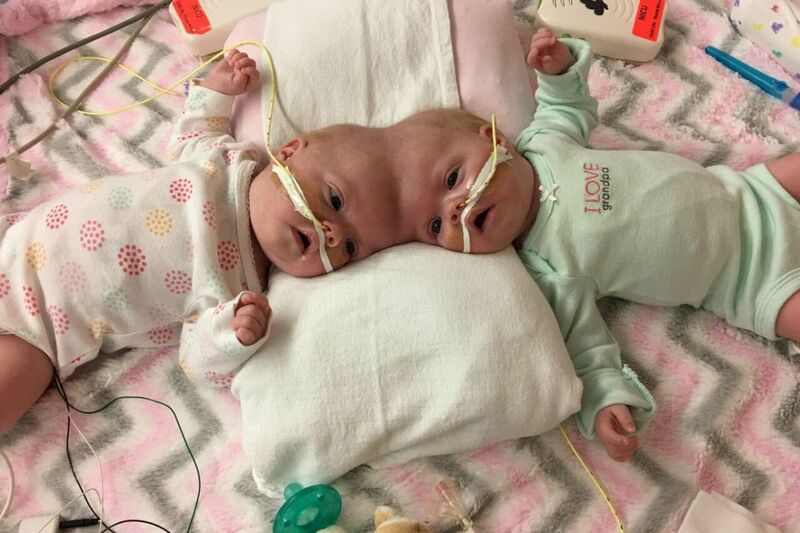 "Separating conjoined twins is a very complex surgery followed by a long and complicated recovery, but we are very hopeful for a positive outcome," plastic surgeon Jesse Taylor, who co-led the operation with neurosurgeon Gregory Heuer, said in a statement from the hospital. "Erin and Abby are now recovering in our pediatric intensive-care unit under close monitoring by our expert teams," Taylor added. The parents, Riley and Heather Delaney, learned that she was carrying conjoined twins just 11 weeks into her pregnancy. Although it was too soon to know whether the babies could be separated, the couple contacted Children's and began bi-weekly treks to Philadelphia for prenatal care. At 20 weeks, Heather Delaney moved into the hospital's special unit for mothers carrying fetuses with serious birth defects. She received state-of-the-art care until the birth by cesarean section on July 24, 2016. The complicated separation involved dividing the infants' shared cranial blood vessels and dura, the protective membrane surrounding the brains. Then, in the riskiest part of the process, surgeons separated the sagittal sinus, an area beneath the brain that allows blood to drain outward from the center of the head. Conjoined twins occur when a developing embryo starts to split in the weeks after conception, but stops before separate identical twins are formed. This happens about once in 60,000 births, and most are stillborn. Fusion just at the skull accounts for about 2 percent of cases. Medical advances have increased the chances of success in separating conjoined twins. C. Everett Koop, the late pediatric surgeon whose career included more than seven years as U.S. surgeon general, operated on 10 pairs of conjoined twins — the first in 1957 — while he was a surgeon at Children's. But craniopagus twins remain hugely challenging, and permanent neurological disability is a risk even when they survive. That was the sad outcome of a 1987 case that involved pediatric neurologist Ben Carson, more recently known for his 2016 presidential bid. The Delaneys and the Children's medical team declined to conduct any media interviews. But in the news release, the parents said they look forward to bringing Erin and Abby home later this year for the first time. "When we go home, it's going to be a big party," Heather Delaney said in the statement. "Welcome home, baby shower, first birthday."